Published: Feb. 9, 2017 at 01:36 p.m. Updated: Feb. 9, 2017 at 02:47 p.m.
With the 2016 season in the books and the NFL Scouting Combine on the horizon, I thought I'd look back at the players who just completed Year 1 in the NFL and assemble an All-Rookie Team. Looking at the group below, I see a strong collection of young talent, with a number of players who have the makeup to routinely hit the Pro Bowl in the coming years. Note: This year, I decided to include a third cornerback and a special teams player. Draft position: Round 4, No. 135 overall. 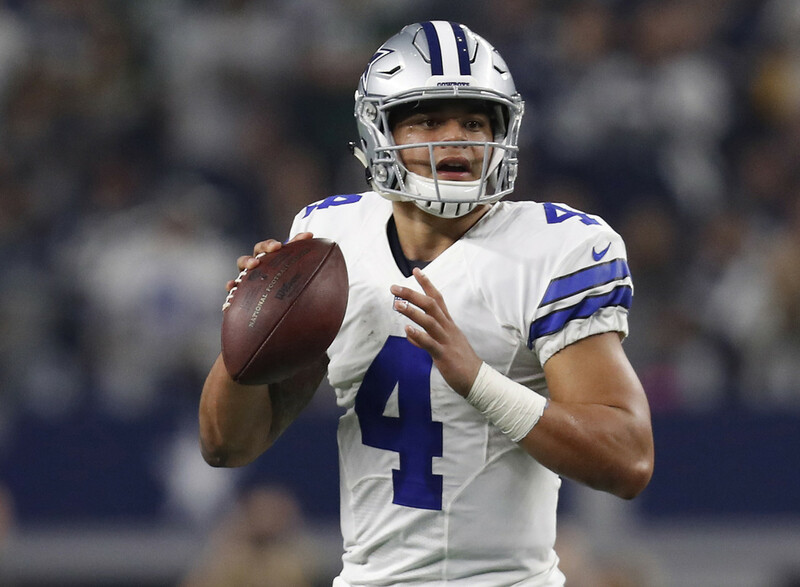 Prescott's numbers -- completing 67.8 percent of his passes (311 of 459) with 23 touchdowns, four picks and a passer rating of 104.9 -- are off the charts for a rookie who was slotted in at No. 3 on the depth chart at one point. Obviously, this is the player everyone's talking about. The first-team All-Pro can catch, block and run. With 1,631 yards on the ground, Elliott led the NFL in rushing by more than 300 yards. Draft position: Round 5, No. 150 overall. Howard racked up 5.2 yards per carry -- and 2.2 yards per carry after contact. His accomplishment -- rushing for 1,313 yards and six touchdowns -- stands out even more given that he didn't make his first start until Week 4 and played for a team that didn't really get much production out of the quarterback spot. Draft position: Round 2, No. 47 overall. Thomas was one of the steals of the draft, and he's going to be a star. He's a big target, has great hands and runs fabulous routes, especially for someone who was a three-year college player. Thomas had 92 catches -- second-most by a rookie in NFL history -- on 121 targets and just two drops. Compare that to Julio Jones, who had 83 catches on 129 targets and three drops. Draft position: Round 4, No. 112 overall. Mitchell, who notched six starts, 32 catches and four touchdowns in the regular season -- and, of course, six grabs for 70 yards in Super Bowl LI -- really came on toward the latter half of the season. He's going to be a very good deep-threat receiver. Henry averaged 13.3 yards per catch and totaled eight touchdowns on 36 catches. He's a very good red-zone receiver and improved a lot as a blocker during the season. I think he's going to be a very productive tight end. Draft position: Round 1, No. 16 overall. Decker started all 16 games and played every offensive snap for the Lions, allowing four sacks and incurring three holding penalties (both respectable marks). He's very athletic for his size and will continue to get better after a great first year. Conklin allowed one sack and was not called for a holding penalty in 16 starts. It was really a surprise how well he played for a rookie, earning a first-team All-Pro nod. The Titans have the makings of a pretty good line (and team). Draft position: Round 3, No. 78 overall. Thuney gave up just two sacks and surprised by playing well for a Super Bowl-winning team. Tunsil spent 12 games at guard and two at tackle, finishing with three holding penalties and 1.5 sacks allowed. He'll eventually be the starting left tackle in Miami. Draft position: Round 2, No. 56 overall. Whitehair started all 16 games as a center after being a college tackle and guard, and he was called for three holds and allowed one sack. He should be a fixture on the Bears' line for years to come. Draft position: Round 1, No. 3 overall. I think the Defensive Rookie of the Year surprised nearly everyone by coming in and playing like he did after a holdout. Bosa racked up 10.5 sacks and 46 pressures in 12 games. Draft position: Round 2, No. 39 overall. A situational pass rusher who was limited to three starts as a rookie, Spence nonetheless contributed 5.5 sacks and 12 quarterback hits. I think he'll be a steady professional in the years to come. Jones was one of the biggest surprises of the draft in terms of outpacing expectations. He's clearly learned how to play hard, putting up two sacks and 11 hurries in 16 games (11 starts). He has unlimited potential. Draft position: Round 1, No. 7 overall. Buckner started 15 games, piling up six sacks and 20 hurries. He's a really good football player who will only get better -- I see him as a future perennial double-digit sack guy. Draft position: Round 2, No. 52 overall. Jones is one of the new breed of linebackers, where the emphasis is on speed and the ability to run toward the ball. He played in 15 games (13 starts) and finished with 108 tackles -- the most among rookies -- three picks for a league-high 165 return yards (with two returned for touchdowns) and a forced fumble. Like Jones, Lee is a linebacker who thrives in a game built on speed. He has a chance to be a future star. He finished with 73 tackles -- that's a lot of tackles for someone who started just nine times (out of 13 games). Floyd was hampered by injuries, including a pair of concussions, but he still managed to put up seven sacks in 12 games. I think he's going to develop into a very good pass rusher for Chicago. Hargreaves was targeted 114 times and gave up touchdowns on just two of his burns. He's a really good man-coverage guy, and it's very hard to get separation against him. Ramsey isn't flashy, but he makes everything look easy. If you were to assemble the perfect defensive back, it would look like Ramsey. Some thought the Giants reached for Apple in the draft, but I think he outplayed expectations, posting 51 tackles, a pick and a forced fumble. Apple looks like he'll be a cornerback in the NFL for a long time; he can play inside or outside. Some thought Neal was overdrafted, but he proved to be a significant contributor to the Falcons defense, notching 106 tackles, five forced fumbles and nine passes defensed. He's a smart player and a big hitter, like Kam Chancellor but faster. Davis played in 16 games (nine starts), splitting time at corner and safety. He finished with 70 tackles, 1.5 sacks, five passes defensed and one pick. Davis is a good fit for the way the Steelers play defense, thanks to his versatility. He's a good tackler, very smart, and I think he'll be a solid player for a long time. Draft position: Round 6, No. 179 overall. Kaser averaged 46.3 yards per punt and did not have a single punt blocked, though he did have one returned for a touchdown. He's a very good directional kicker. Lutz has a very strong leg. He needs to get more accurate, but I think he'll improve in that area. He converted 28 of 34 field-goal attempts, including 3 of 7 from 50 yards or more, and hit on 49 of 50 extra-point attempts. Hill might be the quickest and fastest player in the NFL right now. He showed himself to be a threat to score in multiple ways, whether in the return game (two punts and one kick returned for touchdowns), as a receiver (six touchdowns) or running out of the backfield (three). He earned a first-team All-Pro nod as a punt returner and will only get better as a receiver as he gains experience. Draft position: Round 4, No. 111 overall. Killebrew played some as a backup safety, but he truly excelled on special teams for the Lions, contributing eight solo tackles.